West Linn wasn't going to let this one get away. Not this way or that way or any way. The fourth-ranked Lions, hosting No. 13 Clackamas at West Linn High School in the second round of the Class 6A state playoffs on Saturday, dropped the first set to the Cavaliers and got pushed the rest of the night before ultimately pulling away to win 23-25, 25-20, 25-22, 25-15. 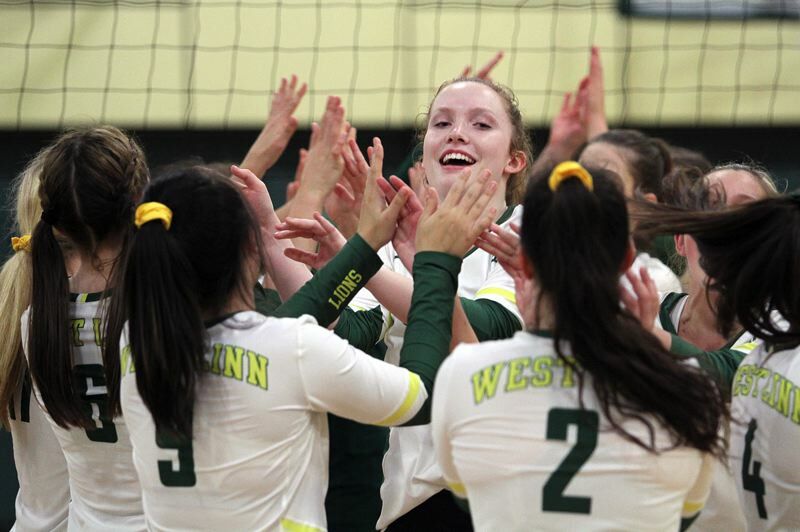 "(Getting back to state) was a huge goal of ours and we didn't want to end this season on a loss on our home court," said West Linn senior libero Ellie Snook, the two-time Three Rivers League Player of the Year. "We are going to go out fighting." With the win — the Lions' sixth straight — West Linn improved to 20-5 overall after winning the TRL at 14-0. Next up, the Lions will return to the Class 6A state tournament where they finished third a year ago; West Linn will face No. 12 Sheldon — the Southwest Conference champion — in the quarterfinals at 1:15 p.m. Friday at Liberty High School. The 13th-ranked Cavaliers, meanwhile, ended their season at 18-5 after going 11-3 and placing third in the Mt. Hood Conference. In the night's first set, talented Clackamas — getting big contributions from Caston, Fonville, senior middle blocker Kalani Hayes, sophomore libero/defensive specialist Christin Kwon, and junior outside hitters Jaiden Armitage, Jayla Parnell and Jaiden Eubanks — fought off a tough West Linn challenge to win 25-23 and knock the Lions back on their heels. West Linn sophomore outside hitter Audra Wilmes admitted to some nerves after the loss, but knew what the Lions needed to do to turn thigs around. "We just really had to focus on our serves and our serve-receive because that's kind of where we stumbled, so that's where we had to focus and go all out," she said. In the night's fourth set, the Cavaliers strung together three straight points — a kill by Hayes and back-to-back tips by Caston — to close within 16-12. But the Lions held the upper hand down the stretch, ending the match on a 9-3 run that included a kill and an ace from Wilmes, a kill and a stuff block from senior Erika Isaacson, an ace by senior Hannah Hashbarger and a block from Long. "We just came in with a dig or die attitude," Long said. "We wanted to push our limits and we knew we could and look where it got us. It got us the win so I'm super excited." Oct. 24: The Lions opened the state playoffs with a 25-6, 25-16, 25-14 sweep of No. 29 Grants Pass on Oct. 24. The Lady Cavers ended their season at 11-18 after placing fifth in the Southwest Conference.